NOT COMPATIBLE WITH "FAST CHARGERS." Fast Chargers will burn out your cables. Brand new Glow in the Dark Cable with Micro USB Connector which is compatible with Micro USB connector (Samsung Galaxy and Note, HTC, Android, Etc.). Newest cable design, combines smooth round cable features and smaller connectors than typical glow cables. The smaller connectors means that they fit with more phone cases. Each cable has two different color LEDs. Choose from 3 color combinations of cables, or get the pack of 3 cables and save! NOT COMPATIBLE WITH "FAST CHARGERS." Fast Chargers will burn out your cables. 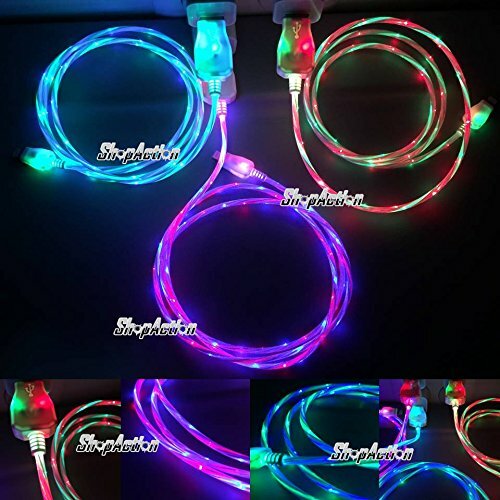 Glow in the Dark Cable with 8 pin Connector which is compatible with all phones with Micro USB connector: Samsung Galaxy Note, HTC, Android, etc. Newest cable design, combines smooth round cable and smaller connector to fit with more cases. Each cable has two different color LEDs; these are bright; great for kids or to easily find cables in the dark. LEDs are always on while charging and while not charging. LEDs do not "flow." If you have any questions about this product by ShopAction, contact us by completing and submitting the form below. If you are looking for a specif part number, please include it with your message.